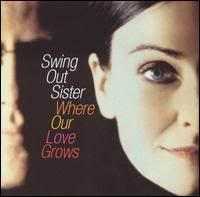 Swing Out Sister, based in the UK, is a group that arrived on the scene back in 1985. Its influences include 1960's Burt Bacharach sophisticated yet breezy pop and 70's Easy Listening music. The band started off as a synth pop dance band and in its 25 plus years has matured into a cool jazz style that was labeled "Motown-Lounge" in a recent radio interview. Their music has also been labeled "Sophisti-pop". Although their record company gave them little to no support over the years they have kept at it and issued albums on a regular basis. The band is still popular in Japan. Thanks to the Internet, it is much easier to obtain their studio albums, even the ones never released in the US or UK. Here in the US, the band has a "cult" following and you never know who likes them (unless you join in some fan discussion on the Internet). 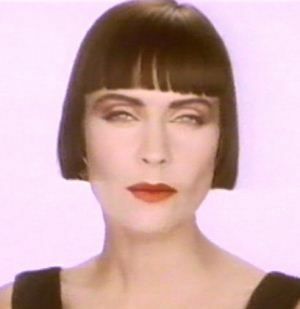 In 2005, the track "Am I the Same Girl" from "Get In Touch With Yourself (1992)" was used as the theme music for the Martha Stewart daytime program. If the maven of entertaining likes them then how can we not? This page is my feeble attempt to express my fandom and hopefully enlighten those who may not know the band or its music. 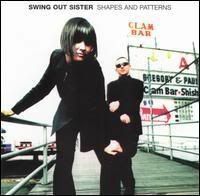 Who Is Swing Out Sister (aka SOS)? She is the lead vocalist and icon for the band. Before SOS she worked in fashion design. 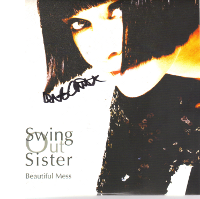 Her voice invokes Dusty Springfield and her image during the early years invoked silent film star Louise Brooks with her lanky frame and helmet hair. He writes the songs along with Corinne. His face is seen in all the videos and on the album covers yet he has only sang backing vocals on one album that I know of. 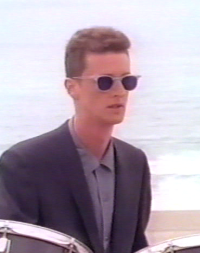 co-founded the band with Andy but left in the middle of working on the second album "Kaleidoscope World (1989)". Paul Staveley O'Duffy does the computer programming, producing, engineering, and mixing the band's albums as well as helping write, compose, and arrange many of the band's songs. He even sang backup on at least one album. Almost any music that use strings and horns - even synthesized - blows my mind and that's pretty much SOS' staple since day one. Some SOS fans mention that they also like film music and many tunes have the feel of soundtrack music from the 60's and 70's. Even though the band's product is the result of heavy producing, their live show is an excellent version of the recorded product. That's important to me. Many bands and singers that are heavily produced sound awful live unless they use a backing track to mask their inadequacies but SOS doesn't need such masking. They may not exactly duplicate an album in concert but that's the point. If you go to a live show you have to expect the unexpected. Corinne & Andy care about the music and not just making a buck. When I first heard their smash hit "Breakout" in 1987 on the radio, I instantly liked them. 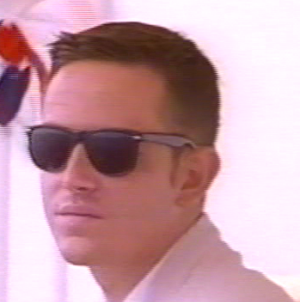 The music, lyrics, and style all seemed fresh - even though it really isn't new. It was totally different than what you heard on TOP 40 radio at the time. 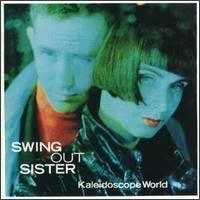 I was also just getting interested in 80's dance music to go along with my interest in New Wave and Swing Out Sister seemed to fit both. I was a fan of other Manchester products like New Order and The Smiths - but SOS seems conservative in comparison. The music puts a smile on my face and I can listen to them all the time if I wanted - and sometimes I do. One favorite is Notgonnachange. 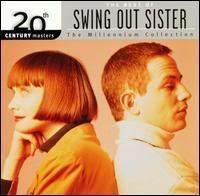 This is the version on the "20th Century Masters - The Millennium Collection: The Best of Swing Out Sister (2001)" album is much better than the version on "Get in Touch With Yourself". The bass line is so cool and the strings get to me. Another favorite is Am I The Same Girl. I have always loved the instrumental version of this song and until the SOS cover, I didn't know it had lyrics. This video shows the band playing the song "live" in 2001. These are just the albums that were released in the US. These and most of the other albums are available via Amazon, iTunes, and/or ebay.com, or if you have a really great record shop. smash debut that includes the single that started it all for them "Breakout". a good 2nd album that didn't try to duplicate the sound of the 1st as the record company wanted. Includes an orchestra and more retro sound. It pretty much started the sound we hear in SOS Music today. You On My Mind, Where In The World, Waiting Game, and Tainted. 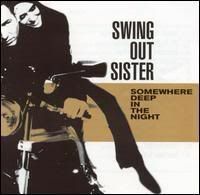 This album got them back "in touch" with US audiences with the hit "Am I The Same Girl". This is one of my favorite SOS records. Am I The Same Girl?, Notgonnachange, Circulate, Love Child, and Incomplete Without You. The move to a cool jazz/funk sound is complete on this album. It's also the one album that Producer Paul Staveley O'Duffy was not involved with. Better Make It Better, That's The Way It Goes, and La La (Means I Love You). SOS returns to a mesh of the last two albums to form an excellent single unit. O'Duffy, who co-wrote half of the songs, returns to produce. Somewhere In The World, Here And Now, We Could Make It Happen, Stone Soul Picnic, Now You're Not Here, Better Make It Better. 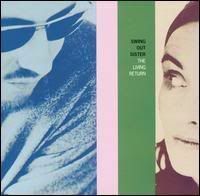 Normally I wouldn't mention a Greatest Hits album since I want to highlight proper studio albums, but this one is a must have if only for an excellent remix of "Notgonnachange" and the only album to offer "Who's Been Sleeping" in the US. For a completist like me, you have to have this one and if you are new to the group, it is a good intro since it includes all the hits to date. More of the same - in a good way. In fact the music on this album sounds so lush you forget the lyrics are so dark. Where The Hell Did I Go Wrong?, Where Do I Go? Waited a long time for this disc and the wait was worth it. The sound invokes a smoky jazz club. The band continues their jazz combo style. Where Our Love Grows, Let The Stars Shine, and Happy Ending. 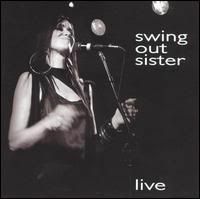 A great example of their live performances especially if you can't see them in person or if you can't get their rare live CD "Live at the Jazz Cafe (1993)"
Another long wait for an album but it was worth it. Back to a jazzy tone. Paul Staveley O'Duffy was not involved this time. Andy produced for the first time. 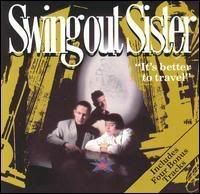 swingoutsister.com - the officially endorsed unofficial website run by Kun Kim. Excellent info on the band, full discography, and fan discussion forum. The band also leaves notes from time to time.